Brad Paisley – Life Amplified World Tour: Live at WVU – Entertainment Ave! Pretty much just a concert film without any behind the scenes or tour footage, the DVD does its best to highlight the music, as well as things that can happen at a Brad Paisley concert. Examples include his signing of someone’s guitar, lots of blistering guitar solos (the one on “Perfect Storm” was especially awesome), and a nice moment where, after “Letter to Me” and the intro to “This is Country Music,” he signs his acoustic guitar, finds a youngin’ in the audience, gives the guitar to the lad with the instructions, “Learn how to play it. We’ll see you up here in ten years kid!” Nice. There’s also some hijinks during “She’s Everything” as he grabs a phone from the audience, shouts “Let’s make a video! First let’s look at her photographers – no pictures of Chris Young! (Chris Young joined him earlier on “I’m Still a Guy”)”, makes said video, and notes “I hope I gave that back to the right girl!” I was wondering the same thing. You have cheerleaders during “Country Nation,” you have rain, but mostly you just have 15,000 people enjoying the hell out of Brad Paisley. I would have like some behind the scenes footage, but as far as straight concert films go, if you are a Brad Paisley fan it’s up there in something good to add to your collection. It is kind of funny seeing the concert from all of those angles, especially of how things have changed with how the young folks enjoy a concert nowadays, a lot of it through the screen of their smartphone as they instantly share the experience around the world rather than soak it in, but maybe I’m just getting old. Hell, I remember having to sneak in my camera with a thing called film, and then having to wait until later to share my experience with the world. What a world we live in! Sorry for my slight digressing. If you’ve ever wanted to see Brad Paisley but haven’t been able to go, or just want some great, live Brad Paisley, this one’s a keeper. 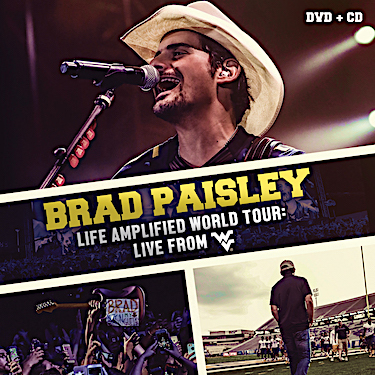 It’s 4 stars out of 5 for Brad Paisley: Life Amplified World Tour: Live at WVU.